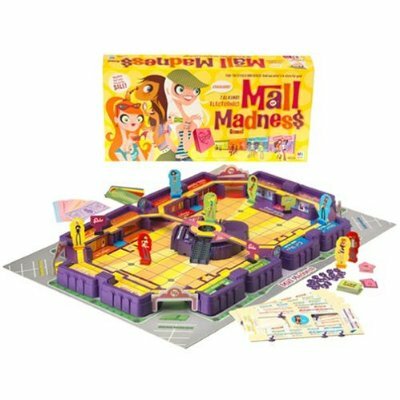 I swear that I was not a teenaged girl in the ’80s (Tiffany tapes aside…) and didn’t typically make a habit of playing with dolls or anything, but I used to really want a copy of Mall Madness. Who knew they still *made* this? My family is probably way off the demographic map for this game. My 6 yr old son picked out this game much to my husband’s dissatisfaction (he wanted him to get a nerf target shooter). Well, we all had a total BLAST playing this game!! I had no idea they made that either. The Mall Tycoon game series is going strong as well. … I’ve always wondered what it would be like to have actual executives from some of the mall companies sit down and play these games and see how they do. There’s also a Hannah Montana version of this game. Mall Game. The brand-name shopping game. More retail than shopping, really. First thing I thought of was the Hannah Montana version of this game (but someone beat me to it). It was on sale at Toys R Us recently. It’s very popular (as is anything with that marketing whore, Hannah Montana). It’s been a long time since I thought about this game (or played a board game for that matter). Looks like fun. I wanted this board game too when I was younger. I also have the Mall Tycoon series…..well the first two titles anyways. They’re a bit fun, if somewhat buggy and have flaws. ie: no ‘two-sided’ storefronts to fill out corner spaces….lots of jewelry stores and food tenants take up these slots, ‘food court’-sized spaces, and the ‘department stores’ work oddly..in both games. Then again, they’re set in a virtual world….they’re not meant to resemble realism. I have so many ideas for a ‘perfect’ simulation / game, but it’s all locked away in my mind, and I’d hate to spin this off topic. I used to have a mini version of a mall board game. It was when they had a few different games that folded up into little cassette tapes. It had little magnetic peg pieces.It may have been called Mall Madness too but I don’t remember for sure. I have not played this large version but I do have a young niece who I might get this for when she’s old enough to play board games. I also have several of the Mall Tycoon type PC games. I wish they did a better job with making them but at least someone tried. I have one of the earlier copies, with the pink and purple box. It’s so funny to see items like “cassette tape” listed on the shopping card. It’s a fun period piece from my childhood, and my friends and I drag it out every once in a while. I have “The Mall Game” that was mentioned by Jonah. Never played it, but it’s cool to have around for the graphics and long-lost stores.